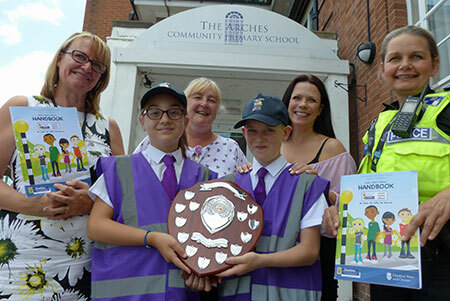 The Arches Primary School in Blacon, Chester has been awarded Junior Safety Officers of the Year award 2018, having received the award in 2017. Two pupils from the school, Jack Barnes and Rose Robson-Hall were this year’s winners and pupils from Willow Wood Primary in Winsford and Tattenhall Park in Chester received Highly Commended awards. The awards recognise their hard work in promoting road, community and personal safety messages both within their schools and to the wider community throughout the past year. Jack and Rose received certificates and prizes, which were presented to them by Road Safety Officer, Lue Ellis from Cheshire West and Chester Council and PC Sally-Anne Malone from Cheshire Constabulary. Headteacher, Michelle Ashfield, received the Junior Safety Officer shield on behalf of the school. Highly commended awards, certificates and prizes were presented to the pupils for their outstanding hard work at separate events organised at the commended schools. The Council’s Cabinet Member for Environment, Councillor Karen Shore said: “All primary schools within the Cheshire West and Chester are invited to nominate two Year 6 students to take part in the Junior Safety Officers Scheme. “This is not only with the intention of spreading safety messages within their schools, but out to parents and their local communities.The Council’s Road Safety team and Cheshire Constabulary continue to work closely with the children, so that everyone understands how vital road, personal and community safety is. Headteacher Michelle Ashfield said: “We are delighted that our pupils have been awarded Junior Safety Officer of the Year award for the second year in a row. Jack and Rose, with help from their JSO Buddy and Teaching Assistant, Zoe Holt, have given their all to promote road, personal and community safety. They are a credit to our school, thoroughly deserving the award. Each Junior Safety Officer kept a detailed diary of how they raised awareness of road, personal and community safety in their individual schools over the past 12 months as a record of their work and achievement. The Arches Community Primary School JSO winners.